The Royal Posture support brace won’t perform any miracles on your back. But, for the price, it’s an excellent option if you only want support for a few minutes a day while sitting down on a chair or at a desk. The Royal Posture is one of the cheapest posture correctors in the market. The posture corrector aid is available through online retail stores such as Amazon and Walmart. The company behind the Royal Posture corrector is known as BulbHead. This company does not specifically specialize in any particular product. Instead, it operates by crowdsourcing ideas from users and developing products based on those ideas. The Royal Posture corrector is one of the many products that the company has. The Royal Posture is a posture aid designed to support your spine, neck and lower back. The posture aid is made from a combination of cotton, nylon and neoprene. These materials are not good for machine washing. Thus, you will have to wash the corrector by hand and hung it to dry. There are 12 magnets sewn onto the back support of the posture corrector. 6 of the magnets run horizontally at the back while 6 run vertically along the spin. Why Are the Magnets Important? From looking at the magnets on the Royal Posture Back Support brace, it is clear they offer some health benefits such as pain relief of spine realignment. The use of magnetic therapy has been around for years. The magnets used in the therapy are not the typical ones found on refrigerator doors. Instead, they are bio-magnets. These magnets are specifically used for pain management and physical healing. However, it is important to note that these claims have not been scientifically proven, just like is the case with many claims in alternative treatment therapies. You can find out more about magnetic therapy at Spinuniverse. You can easily put on the Royal Posture corrector on your own. Wearing it is just like you would a vest. The corrector also has adjustable tightening straps at the upper back area. After putting it on, fasten the corrector around the torso with the Velcro straps. You can also adjust the shoulder straps with the available plastic slide buckle. To benefit from the corrector, tighten the straps until your shoulders are in good position. Do not over tighten them. When you wear the corrector, the support will hold your body upright and prevent the shoulder from slumping. TIP: To wear the corrector properly, look in the mirror while adjusting the straps. This way, you can be sure of having a good posture. You may be tempted to wear the Royal Posture a little loose to ensure a comfortable fit. However, the manufacturer recommends wearing the posture device as tightly as is comfortable for it to have maximum impact. According to the manufacturer, you should wear a T-shirt underneath the Royal Posture for additional comfort. The small/medium size is recommended for people with 25-inch to 36-inch waist. For women, the device will fit you if you wear dress size 0 to 16. The large/extra-large size is meant for people with waist size 37-inch to 59-inch. For women, those wearing dress size 18 to 56 will fit in this posture corrector. Does Royal Posture Help With Neck and Back Pain? Poor posture is one of the common causes of neck and back pain. According to a study submitted at the University of North Carolina, the relative weight of your head doubles due to gravity for every inch of forward head posture. This weight can lead to neck and back pain. When you start wearing the Royal Posture, within a few days, it will start relieving the pain you may have been suffering. This relief will be even more evident when you become more aware of your posture and start positioning our head over the shoulder properly. The result will be less back and neck pains. Most people do not want posture braces to be seen underneath their clothing. The ability of a brace to be concealed is one of the factors most people consider before buying. The Royal Posture does not show under the clothes. You can wear the Royal Posture under the skin. This is one of the hidden posture correctors. However, for comfort, wear it with an undershirt. If you are not wearing skin-tight clothing, detecting the brace underneath will be nearly impossible. You will quickly get used to putting the vest on and off as you wear it every day. With time, you may have to adjust the straps to ensure a comfortable fit. There are a number of things you should keep in mind when looking to buy a posture corrector. These things include the value you will be getting, effectiveness, quality and cost of the corrector. 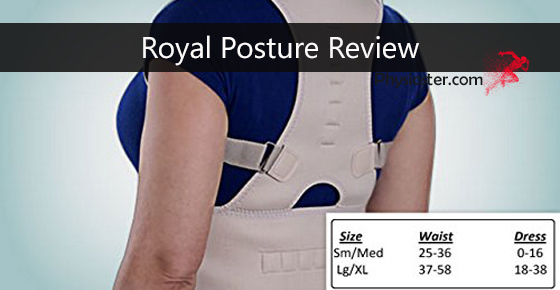 The Royal Posture back support brace has its strengths and weakness. When it comes to cost, it is nearly impossible to find a posture corrector that is as cheap as the Royal Posture Back Support Brace. The Faburo corrector is, perhaps, the only one comparable in price to the Royal Posture. Quality is one of the important factors to consider when choosing a posture corrector. Like is expected of low-cost products, the materials used to make the Royal Posture and the craftsmanship are not really that high quality. In the end, the value you will get from the Royal Posture is in terms of cost. If you have slight pain and are looking for a cheap posture corrector to try, go for the Royal Posture. However, if you are after quality, you should check the best posture correctors in the market.